U.S. Vice President Joe Biden’s apology to Saudi Arabia, the UAE and Turkey is irrelevant. What is important is what he said, as it reveals that our vision to situation in Syria is still very different from the American vision. Saudi Arabia, Turkey and the UAE believe that the Syrian regime is the problem and must be overthrown by supporting the Syrian revolution in order to eradicate the real cause behind the emergence of ISIS. On the contrary, Washington sees that the Assad's regime should remain. Therefore, it is necessary to reconsider Jeddah’s alliance against ISIS and define its goals before jumping on the wagon with the United States, whose vision may be blurry in the best case scenario or could have a different set of aims altogether. The Saudi-American disagreement over Syria is nothing new. It dates back to the origins of the Syrian revolution which is almost four years old. While Saudi Arabia wanted a swift intervention in the first year of the crisis to spare the Syrians and the region the scourge of war, the U.S. response was lackluster, drawing red lines that were not respected by Bashar al-Assad. The U.S dropped plans to attack Assad at the last minute and this angered Riyadh. This disagreement was leaked to the media on many occasions and was one of the reasons behind the visit of President Obama to Riyadh in March. The question now is: Will Biden’s remarks revive the Washington-Riyadh dispute over the crisis in Syria? What did Biden say to trigger the anger of Saudi Arabia, Turkey and the UAE all at once? He accused the three countries of being responsible for the rise of hardliners in Syria, including ISIS. Biden told students at the John F. Kennedy Jr. Forum at the Institute of Politics at Harvard University that: “Our allies in the region were our largest problem in Syria,” adding that Turkey, Saudi Arabia and the UAE were “so determined to take down Assad,” that they started a “proxy Sunni-Shiite war” by giving “hundreds of millions of dollars and tens of thousands of tons of weapons” towards anyone who would fight against Bashar al-Assad. He went on to add that the Arab powers ended up supplying extremists from al-Nusra Front, al-Qaeda and other jihadist hardliners from all around the world. Making things worse, Biden compared America's alliance with Saudi Arabia to its previous alliance with the Soviet Stalin during World War II. Thus, it would be naive for the concerned countries to accept the apology that was formulated in a way that did not deny Biden’s catastrophic statement. It only sought to keep the coalition against ISIS, without providing clarifications about the objectives of the campaign that has become so unclear that they are now speaking about a war that may last for weeks, months or even years! It would be naive for the concerned countries to accept the apology that was formulated in a way that did not deny Biden’s catastrophic statement. There are certain things that should raise concerns about this war and this alliance: the first is the apparent failure to identify the enemy, which is only revealed after it is bombed. The bombing did not only target ISIS and the al-Nusra Front as it even affected groups described as moderate such as the "Hazzm” movement. Hazzm received advanced American “Tao” anti-tank missiles. Moreover, the bombed sites included headquarters of battalions against the Assad regime, at a time when bombing ISIS, which really constitutes a threat against the civilians on the outskirts of the city of Kobane, was delayed. Syrian activists were shocked but they held their silence so that they won’t be regarded as rejecting the alliance, since they have long asked for an external intervention that would rescue them from the regime of Bashar al-Assad, his army and barrel bombs that are still targeting Syrian citizens. This is the reason behind the circulation of the common joke stating that the alliance bomb at night while Bashar does so during the day. Meanwhile, several military experts expected the coalition to impose a no-fly zone over northern Syria, at least to protect its aircrafts that are on a mission against terrorism, but this has not happened yet. Something else was revealed after “Ayatollah” Biden’s remark. It is the U.S. insistence on rejecting the Turkish proposal to impose a buffer and no-fly zone in northern Syria. President Erdogan insists on that as a condition for entering the war against ISIS, in addition to the other conditions characterized by the clear commitment by the U.S. to overthrow Bashar al-Assad within the framework of the war on terror. The Turkish president’s goal is clear: to drag the United States to intervene, which will eventually lead to Assad’s fall and put an end to this protracted conflict which is now threatening the regional security of Turkey and all the countries of the region. What is suspicious is that the U.S. refused this legitimate demand from Turkey and Saudi Arabia, especially as Turkey and other countries are now ready to intervene and be the ground force that can end the conflict against ISIS and Bashar together. This is what the U.S. repeatedly asked for, but now they are only asking in the capacity of fighting against ISIS. In the best case scenario, we would say that they are afraid to reiterate their past mistakes in Iraq. The U.S. might be afraid that the fall of the regime will trigger chaos all over the country. So in the meantime, while Obama arranges his cards and sets out a full plan to face ISIS, it will be useful for the concerned countries to put their differences aside and develop a plan for the period following the fall of Assad. That plan should specify the role of each country and all parties should agree with the moderate Syrian opposition on the procedures of the political construction of a new Syria. It will then be possible to sort out the rebels according to their acceptance of the principles of democracy and their willingness to work with others. If we do not do so, and as long as the Americans are now talking as if they were Iranians, we should expect an arrangement between the two that will surprise us. We should always remember that neither permanent enmity nor a permanent friendship exists. The only thing that lasts is personal interests. This article was first published in al-Hayat on Oct. 11, 2014. Jamal Khashoggi is a Saudi journalist, columnist, author, and general manager of the upcoming Al Arab News Channel. He previously served as a media aide to Prince Turki al Faisal while he was Saudi Arabia's ambassador to the United States. 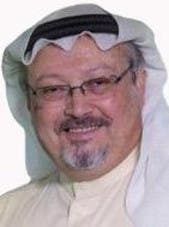 Khashoggi has written for various daily and weekly Arab newspapers, including Asharq al-Awsat, al-Majalla and al-Hayat, and was editor-in-chief of the Saudi-based al-Watan. He was a foreign correspondent in Afghanistan, Algeria, Kuwait, Sudan, and other Middle Eastern countries. He is also a political commentator for Saudi-based and international news channels. Turkey’s paradox: Fall of ISIS or rise of the PKK? Why doesn’t Russia join the anti-ISIS coalition? What comes after ISIS’ defeat?